Ginger water and ginger infused water are incredibly easy to prepare, making them an excellent complement to your diet, as well as a refreshing and healthy drink for a hot day. The fact that drinking ginger water can help soothe many common ailments is what makes this beverage especially beneficial. The main difference between herbal waters and herbal infused waters is that herbal infused waters require heat. However, it should be noted that, while its vitamin C is one of the main nutritional benefits of eating fresh, raw ginger, it can be destroyed by heat, along with other ginger vitamins that are water soluble. For that reason, the vitamin levels in ginger infused water may be lower than in fresh ginger water. Ginger water. Using a knife, vegetable peeler, or spoon, peel away the skin on two one-inch (3 cm) pieces of ginger. Combine with 32 ounces (950 mL) of purified water and allow the mixture to chill and steep for four hours or overnight in the refrigerator before straining the mixture. Ginger infused water. After peeling away the skin on your fresh ginger root, grate or slice three teaspoons of it. Bring 32 ounces (950 mL) of purified water to a boil. Turn off the heat and add the ginger, covering the pot and allowing the mixture steep for at least 10 minutes. Strain the mixture. This infused water can be drunk hot as a tea or set to chill. Because the taste of ginger root has often been described as pungent, it is common to mix a teaspoon of honey with warm ginger tea to improve the taste. However, when drinking chilled ginger water, you may want to include other fruits and vegetables for added flavor and nutrition. Simply cut or slice the fruits or vegetables of your choice into bite-sized pieces or thin slices, and allow them to steep in the ginger water. Some common fruits and vegetables you may consider include lemon, spearmint, peppermint, cucumber, and apple. Drinking ginger water can bring you many of ginger health benefits. It can also be taken to alleviate the common cold, and the use of this form of ginger for upset stomach has proven effective in treating symptoms such as nausea and gastrointestinal spasms. Additionally, ginger properties include reducing oxidative stress, the harmful activity of free radicals in the body, thus showing the potential of this herb as a possible tool in the prevention of some serious health conditions. Moreover, research suggests that ginger effects might be of help in preventing and reducing alcohol toxicity, thus demonstrating ginger's benefits for the liver. Drinking ginger water can be a great way to access the health benefits of this herb. However, like all good things, it should not be taken in excess. Drinking too much water may dilute blood sodium content, causing hyponatremia, which can additionally decrease breast milk intake in nursing infants. It is recommended that adults consume no more than four grams of ginger a day in any form, while a daily dose of one gram should be the limit for pregnant women. Be sure to consult your doctor concerning possible ginger side effects and find the right dosage for you. Among the various medicinal uses of ginger, drinking it as fresh or infused water may be a good option for you. 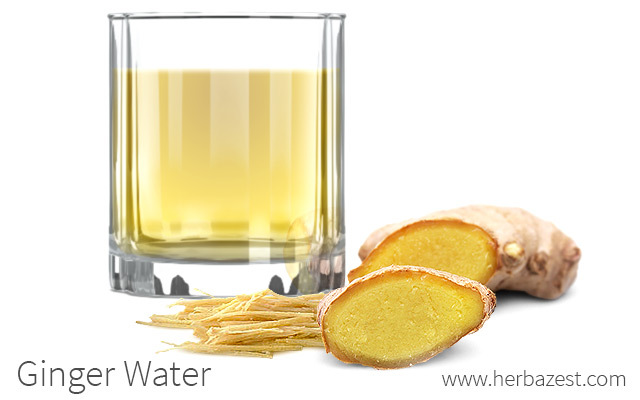 Easy to prepare and mixed with other healthy fruits or vegetables, ginger water is a refreshing complement to any diet.